We know. Seed butters and organic all-natural peanut butter and organic almond butter are incredibly delicious. But for athletes, our seed and nut butters are also important body fuel! Everyone can harness the power packed into each serving of our tasty, handcrafted seed and nut butters. You don’t have to be a serious athlete to benefit from the fuel provided in every jar we produce in our artisanal facility. But if you are, you certainly will! Doesn’t it impact your enjoyment of breakfast, brunch, or snacks to know that you’re choosing health butters packed with omega-3 and omega-6 nutrients, protein, healthy fats, and fiber? The way you feel after you enjoy a healthy meal with protein and vitamins will likely prompt you reach for a jar of seed or nut butter next time. When you eat some before you go for that long Saturday morning run, Sunday afternoon bike ride, late night trip to the gym, or daily yoga class, you will find yourself with more sustained energy. No sugar crashes! Parent of young children? Banish the processed food snacks and have them enjoy a bit of nut or seed butter on toast or wedges of fruit or veggies as a quick and healthy alternative. You can also substitute healthy Almond Butter in virtually any recipe that calls for peanut butter with good results. Breastfeeding moms take note: a serving of healthy nut or seed butter is filling and nutritious, plus easy to snack on while you cradle your baby. Add a serving of Almond Butter (or other favorite health butter) to your next smoothie. Have a teen who doesn’t want to eat the most important meal of the day? Whip up a power-packed smoothie no teen can resist that is great for a growing body and offers sustained energy to young athletes. Sugar free, soy free, gluten free, dairy free, or vegan? No problem. You’ll find our products are labeled clearly so you know the choices that suit your dietary needs – plus, since you are obviously careful with your health, you’ll be happy to know that we source the best natural ingredients and only those that are GMO-free. Don’t run out of fuel for your body. Get off the highs and lows of sugary diets and carbs and try nut and seed butters to feel more energized. 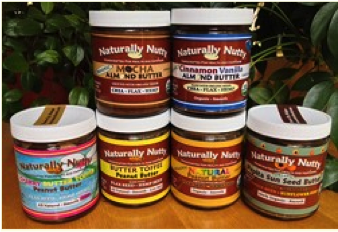 Visit us online at Naturally Nutty to peruse our delicious selection of handcrafted seed and nut butters your taste buds will enjoy as much as the rest of your body.